Eye, Cornea - Cyst in a male B6C3F1 mouse from a chronic study. There is a corneal epithelial inclusion cyst (arrow) filled with keratin-like material with secondary granulomatous inflammation (arrowhead). Eye, Cornea - Cyst in a male B6C3F1 mouse from a chronic study (higher magnification of Figure 1). 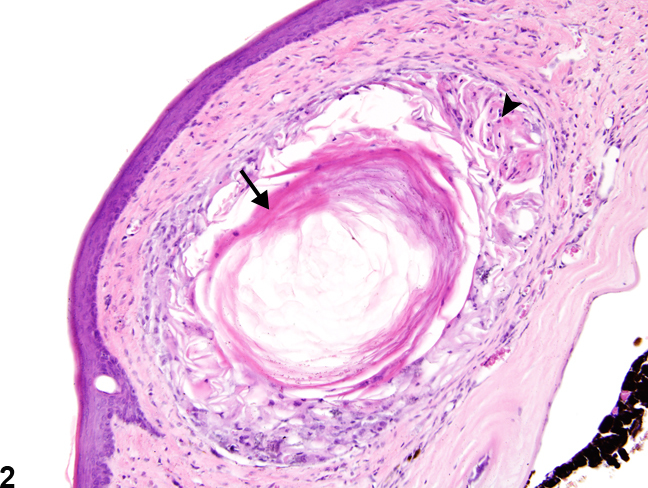 This higher magnification image shows the epithelial inclusion cyst (arrow) and associated granulomatous inflammation (arrowhead) in greater detail. Corneal epithelial inclusion cysts ( Figure 1 and Figure 2 ) consist of a stromal cavitation lined by a single layer of flattened cells and filled with whorls of keratin-like material. There may be secondary granulomatous inflammation in the adjacent stroma surrounding the cyst. 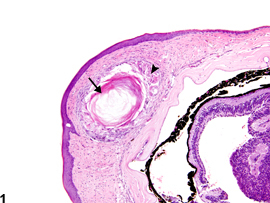 Corneal inclusion cysts may arise during the fetal period or may arise postnatally when corneal epithelial cells become displaced and entrapped in the stroma because of physical trauma or ulceration. Corneal epithelial inclusion cysts should be diagnosed as "eye, cornea - cyst." This finding should be diagnosed as present without assignment of a severity grade. Any secondary inflammation should not be diagnosed separately (unless warranted by severity), though it should be described in the pathology narrative. National Toxicology Program. 1990. NTP TR-378. Toxicology and Carcinogenesis Studies of Benzaldehyde (CAS No. 100-52-7) in F344/N Rats and B6C3F1 Mice (Gavage Studies). NTP, Research Triangle Park, NC.